Digital marketing has come a long way from the early years of the Internet. From paid search to banner ads, retargeting to Facebook advertising, marketers are always finding new and flashy ways to woo their target audiences. Some trendy online mediums have gone in and out of the digital world (R.I.P. Vine), but others have stood the test of time. Take email marketing. The earliest forms of email have been around since the 1970s, which is practically prehistoric in terms of the internet. But unlike the dinosaurs, email isn’t going anywhere. Decades after its debut, email marketing is still producing great results for businesses that invest in the platform. Although it might not have the flashiness of the newest social platform, it’s still an attractive beau nonetheless. Learn more about why your brand should be courting email marketing as part of its digital strategy. 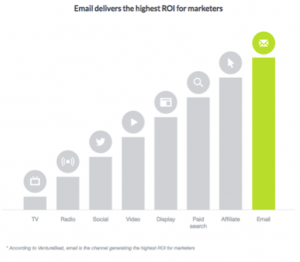 The ROI on email is incredible. A 2016 survey by Direct Marketing Association and Demand Metric found that email had a median ROI of 122 percent, a number four times higher than other channels analyzed, including social media, direct mail, and paid search. At the end of 2016, for every dollar spent, email marketing had a $44 ROI. Email dates are only getting less expensive; in 2015, email marketing earns $38 for every dollar spent, and in 2014, the channel earned $34 on the dollar. This higher ROI correlates with higher conversions. Email generates 174 percent more conversions compared to social media. And with email becoming increasingly more personalized, your marketing messages can be even more tailored to their intended recipients—and more profitable. Campaign Monitor found that emails with personalized subject lines are 26 percent more likely to be opened, and marketers report a 760 percent increase in email revenue from segmented campaigns. 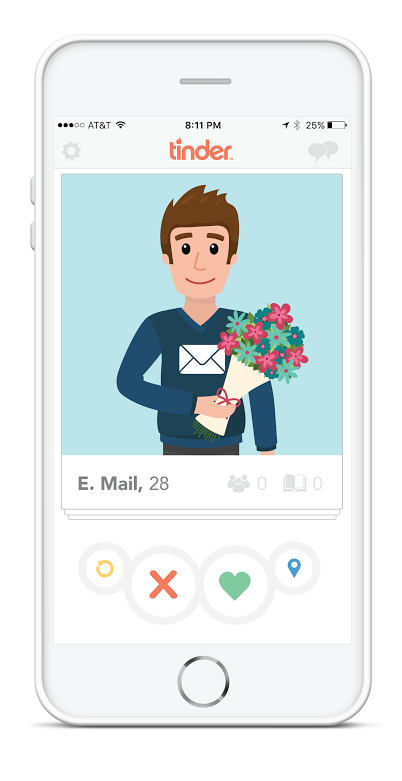 With personalization, you get to flirt one-on-one rather than blasting the same pick-up lines to everyone you’ve matched with. When a potential customer signs up to be added to your company’s email list, it shows they want to learn more about you. By giving you their email, they have effectively asked you into their online home to continue the conversation. They saw something they liked and invited you into their inbox to learn more. Thus, email-marketing messages don’t feel as intrusive because you were invited to keep the conversation going. Assuming you acquire and build your list in a legal manner, anyone on it opted in to your messages. Just like exchanging phone numbers with a cutie at a bar, customers give out their email address with the assumption your brand will be making contact eventually. This means that people expect to see you pop up in their inbox from time to time. In fact, people tend to prefer to hear from brands through email. Seventy-two percent of people surveyed said they prefer companies to communicate via email over any other channel. This lack of intrusion is unique to email. Imagine an ex that just won’t go away: They might have been interesting initially, but they got bland, boring, or were simply no longer a good fit. That’s what it can feel like to see ads online that aren’t relevant to you. Take this scenario: A dad goes to a store’s website to check out the product page of a laptop he is considering buying his daughter. He sends the link to his daughter, who decides she wants a model with a faster processor. The dad takes his search elsewhere, but suddenly that original laptop store is following his digital footprint around the web. He scrolls past a Facebook ad for the machine, and notices a display ad for it on a blog he reads regularly. No doubt, retargeting and display ads have their relevance in a digital media mix. But oftentimes they just can’t compete with what email marketing can do for a business. In this case, the father has decided he is no longer interested, and yet the original laptop just can’t take a hint and let him get on with his day. What’s worse is that some channels can be so thirsty that they can prevent you from getting information you actually want to see. It’s like having to dodge an overly flirty person when you’re just trying to get a drink. Websites might use video pop-ups when a user hits a page, essentially gating the content behind it. Additionally, brands on social media can feel out of place among a customer’s friends and family if they offer irrelevant content. Because email is an opt-in marketing channel, its messages don’t feel so bothersome and unwanted. By signing up for your email list, your customers have opened their doors and invited you inside their online world. Email, then, is a natural place to spend marketing dollars because customers seemingly will never be far from their phones. Therefore, emails literally get you in the pants of your customers—by putting you in their pockets. Your emails will follow them wherever they go simply because their cell phone follows them wherever they go. Of course, it’s not enough for phones to physically be with your intended audience. People need to be checking their emails on their phones—and they are. In 2016, mobile open rates ballooned to 68 percent. Just four years before, open rates on mobile were at only 21 percent. As the smart watch market continues to expand, more and more people will have their emails even closer to their body. With a simple flick of the wrist, an email can appear, ready to woo customers directly. As a sales channel, email marketing can bring impressive results. It’s stood the test of internet time and doesn’t look to be going anywhere anytime soon. Say “I do” to email marketing, and you’ll be involved in one of your best long-term relationships.